In 2017 in order to welcome the 90th anniversary of the founding of the Canisius College, and to improve the quality of educational facilities, the school built the Audio Video Room. The plan is that the Audio Video Room has a capacity of approximately 90 people with good design so that it can accommodate the educational needs that always develop for next 20 years. As one of the best acoustic consultants in Indonesia, ALTA Integra was trusted by Canisius College to design architectural acoustic in the audio video room. 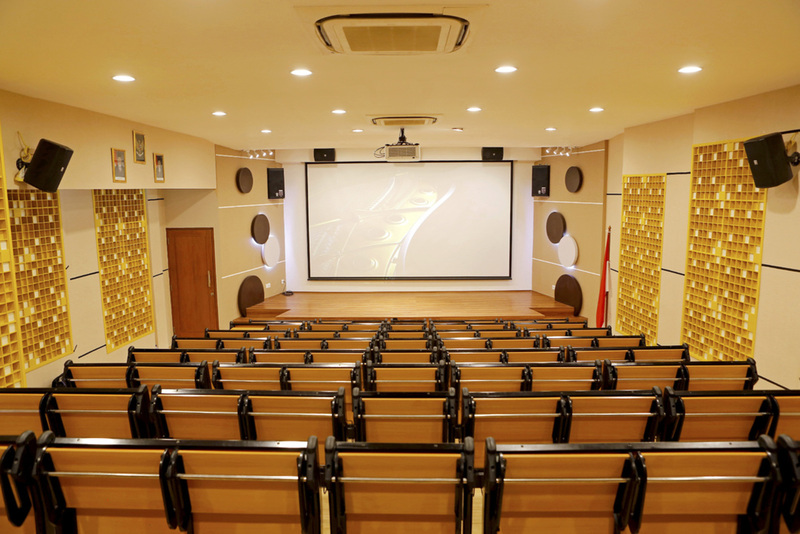 The Audio Video Room which was built can be used both as a multi-media room equipped with loudspeaker and also for music and concert without loudspeakers. For example string quartets, ensembles, classical guitars, acoustic bands, etc. In order for the Audio Video Room to be used for acoustic music performance, the architectural acoustic design should not use the sound-absorbing porous material. So that the acoustic music performance is loud enough to be heard at the last row of seat. The challenge of a room without sound absorbers is echoes and excessive reverberation that reduce sound clarity. Each space has varies acoustic parameters according to the function of the space used. Therefore, ALTA Integra use parameters of reverberation time, bass ratio, energy time curve (ETC), total sound pressure level, clarity (C80) and speech transmission index (STI) in designing the architectural acoustic space of the audio video room. Not only do the simulation but ALTA Integra also makes audio auralization. The purpose of audio auralization is to hear the sound generated by loudspeakers inside the room even though the room hasn’t been built. The design details is expected to make the construction work easier, so that the room that is built conform with what has been simulated.